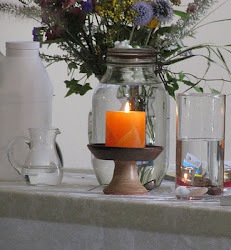 UU A Way Of Life: Could forgiveness be a practice in Unitarian Universalism to bring us to Love? Could forgiveness be a practice in Unitarian Universalism to bring us to Love? George you asked me what my most important spiritual practice is and I told you forgiveness. You asked me how that practice is engaged in. This is an excellent question and worth exploring because forgiveness is both the easiest thing in the world and the most difficult. Forgiveness is difficult because our ego wants to hold on to resentments, grudges, and grievances because these negative feelings makes us feel more powerful, confident, and justified. Also, our grievances are embedded in our fears of being hurt again and still feeling wounded from past hurts. The ego thinks the way to rectify injustice and hurt is vengeance. As Gandhi said, "An eye for an eye makes us both blind." There also is a misguided belief that vengeance is a deterrent to others committing future injustices. However, psychological and sociological research has demonstrated repeatedly that threats of vengeance do not deter the commitment of future injustice but seem to increase it. The explanation of this phenomenon can be based on the idea of separation in A Course In Miracles. Vengeance, engaged in or threatened increases separation and decreases the union of the Sons of God with each other and with their Creator. Perceiving the perpetrator as "the other" " and "not like us" makes it easier to engage in violent thoughts, words, and behavior. What repairs separation and restores relationship and reunion is forgiveness. These principles are the basis of a model of conflict and criminal justice resolution called restorative justice. Restorative justice is another topic for another time so let is suffice for this letter to continue to focus on the idea of forgiveness. Forgiveness is the letting go of the negative hurts of the past which are no longer present in the now except in our fantasies. These fantasies are comprised of what evil we think has been done to us. Our thoughts about this evil is based on our fears and these are based on fears for the body because nothing can harm our spirit without our cooperation and acceptance of the false belief in our spiritual harm. 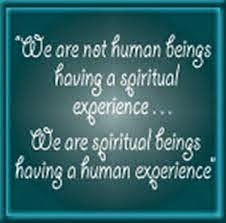 Who can harm us spiritually unless we believe this can be done? Jesus, as he is being executed, says, "Father, forgive them, for they know not what they do." It's as if Jesus is laughing at the absurdity of the idea that his executioners could rid the world of His ideas and love by killing His body. Didn't work, did it, George? Jesus' love and ideas are still here over 2000 years later. The attempt of evil to extinguish Jesus's love of God and us, His brothers and sisters, didn't work. What do you make of that? Seems miraculous doesn't it? Forgiveness, George, is simply the rising above the physical, ego plain, and deciding to focus on the here and now reality of the spiritual plain which is the dimension of life which entails God's love and the union of the Sons and Daughters of the Spirit of Life. Where would you rather dwell, George, in the land of anguish, suffering, and victimhood, or the land of peace, contentment, joy and beloved son or daughter of creation? The most important part of the practice of forgiveness George is to, as they say in AA, turn it over to your Higher Power, whatever you conceive your Higher Power to be. The other saying I like from AA is "Let go and let God." If Jesus can say as they are killing Him, "Father, forgive them for they know not what they do," why can't we do the same thing? Forgiveness, as a spiritual practice, is just that, "a practice." We have to practice forgiveness. Some days we do better at it than others, but the key is patience and persistence. It usually takes repeated attempts to rise above past hurts and injustice and to focus in the here and now. It is a disappointment that Unitarian Universalism does not articulate a practice of forgiveness more explicitly like other religions do. UU does not have rituals of confession, repentance, exoneration, and redemption and we are the poorer for it. Historically, especially in the Universalist tradition, there was a belief in the unconditional love of the creator and being loved unconditionally why would forgiveness even be necessary since sin is not seen as real or having a significance for eternal well being. Martin Luther King, Jr. said "Darkness cannot drive out darkness; only light can do that. Hate cannot drive out hate; only love can do that." Bottom line, George, is to strive to live in the light, and to do that we must tune into Creations love for us so we can extend it to others. As UUs we covenant together to promote and affirm the goal of world community with peace, liberty, and justice for all. I think for UUs and others to practice this principle we must learn how to love and this requires the removal of the barriers and obstacles to our awareness of Love's presence and that removal is best accomplished through forgiveness. Some people like to play the victim. They seem to get off on it. They keep the recriminations going. Negative attention is better than no attention isn't it? Some people are so love starved they'd rather have anguish than nothing. They don't really want forgiveness because then they believe they would have nothing. Some people love to play the game, "Look what you've done to me!" and "Ain't it awful." Our fake news loves to play up the victimization of people under the rubric of human interest stories. This sympathy mongering is a distraction from deeper systemic problems that contributed to the tragedies to begin with. At a societal scale, Naomi Klein writes about this in her book, The Shock Doctrine. Playing the game of "Ain't it awful" and "We'll protect you" allows those in power to play on people's vulnerabilities to strip them of their civil rights and tax them more heavily while they give tax cuts to their cronies. Too big to fail is another perfect example of this. A person cannot say hello to the future until they can say goodbye to the past. I have held on to past hurts because they made me feel justified in my decision to attack others. 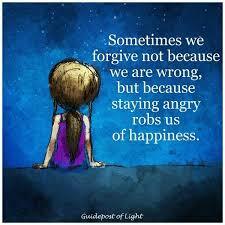 when I have up vengeance as the purpose of my life, I no longer had the need to hold on to the past, so I let it go. Maria, your question made me wonder, "What other purposes would your life have if you have given up your pursuit of retribution and instead forgave your perceived persecutor?" Seems to me we have to call a spade a spade if we are going to get to the bottom of things and then forgive it as you say. without the acknowledgement of what the injustice is, how can we rise above what we wouldn't even recognize and acknowledge is there? Is it that you have learned the importance of naming the problem or the mistake before you can manage it? The whole sacrement of reconciliation in Catholicism is based on the idea of examining one's conscience and naming your sins. Without naming the sin, you can't be forgiven. Do UUs have a similar idea and requirement? Rev. Guengerich at All Soul's in NYC was promoting the idea that the key idea in UU is gratitude. Interesting idea, but how can you be grateful unless you forgive? It seems that forgiveness has to come first before people can feel grateful. So perhaps the key, fundamental idea for UU to me practiced is forgiveness as this article proposes. Helen, I agree. As Ruby Sales said in a post last week, the first question we should ask people is "Where does it hurt?" Until we know how they would answer that question, we don't know how to really help. George asked me what my most important spiritual practice was and I told him forgiveness. I am curious about what other people might say? As a life long Christian when it is written, "It's as if Jesus is laughing at the absurdity of the idea that his executioners could rid the world of His ideas and love by killing His body. Didn't work, did it, George? Jesus' love and ideas are still here over 2000 years later. The attempt of evil to extinguish Jesus's love of God and us, His brothers and sisters, didn't work. What do you make of that? Seems miraculous doesn't it?" I was blown away. That is the most wonderful interpretation of the crucifixion as I have every read. Whenever the motive for behavior is vengeance and retribution we have poisoned the oneness of humanity, and yet we spew this poison all the time in our personal lives and at the societal level. Vengeance and retribution must be identified and diminished and eliminated from our minds.